At the foot of the domain of the doors of the sun 273 tracks and 212 lifts. Station without cars. The bathroom has a bath with integrated shower. 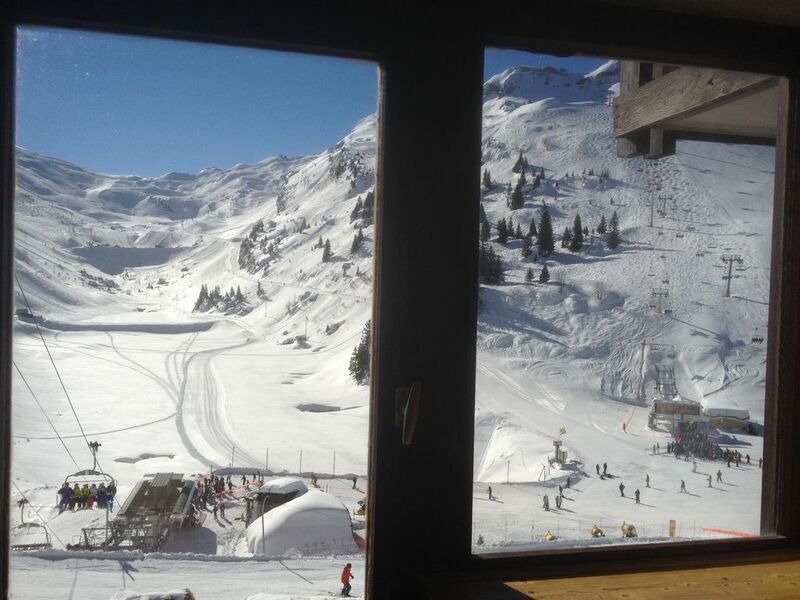 Cosy one bed flat, excellent location ski in ski out. We are a couple who had a lovely time staying in this flat. It had everything we needed. The bathroom is modern and the bedroom is quiet with a comfortable double bed. It’s ski in ski out, close to the lifts. Excellent loacation. The owner was helpful and responsive. We would recommend this flat to other people. Loved this apartment. Perfect for keen skiers. We are a family of 4 keen skiers (Children aged 12 and 14). We loved this apartment. It was small, cosy and well equipped with the most amazing views. Overlooking the mountains made you feel like you were in the middle of nowhere yet still only a 5 minute walk from the centre of town. A great location for us. It was easy to ski in and out. We appreciated the quiet, tranquil surroundings and we slept well in the comfortable beds. The owners were quick to respond and flexible with their dates which meant we were able to stay 10 nights. I would definitely recommend this apartment and I am sure that we will stay here again soon. Le centre d'Avoriaz n'est qu'à 5 minutes à pieds avec commerces, bars et restaurants. Les propriétaires sont disponibles et sympathiques. L'appartement est fonctionnel, au calme, et très bien situé ! La literie est bonne, et la présence d'une baignoire dans la salle de bain est un plus après une journée de ski. Au plaisir de vous recevoir dans notre appartement. Das Skigebiet ist einfach Top, wir hatten auch Glück mit dem vielem Neuschneu, hatten wir seit Jahren nicht mehr. Avoriaz verschneit wundervoll, alles war mit den Ski's oder Boots erreichbar, morgens raus auf die Bretter und zürück mit den Brettern so ist Winter. Das Appartment für zwei Personen war ok, für mehr Personen wirds ziemlich eng. Aber in Avoriaz ist alles etwas eng. Die Pfannen würde ich mal erneuern. Das Appartment war einigermassen sauber, es war auch einige Zeit niemand drin. Skiing: The track serving the main chairlifts passes feet of the building Citron.